BELO HORIZONTE: Manchester United misfit Marouane Fellaini came off the bench to inspire a dramatic Belgian fightback against Algeria on Tuesday as Marc Wilmots' young side opened their World Cup campaign with a 2-1 win. Fellaini, who endured a wretched season at United after his move from Everton, caused havoc among the Algerian defence when he came on as a second-half substitute, dragging his side back into the game with a towering header with 20 minutes to go. 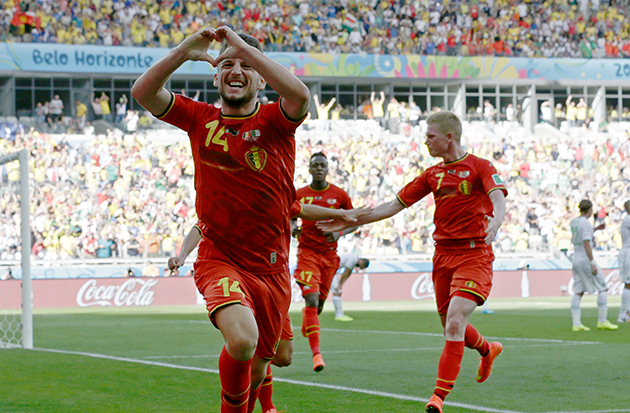 Fellow substitute Dries Mertens fired home 10 minutes later after a pass from Chelsea playmaker Eden Hazard to secure the three points for Belgium, tipped as dark horses to go all the way in Brazil. "(In the) changing room I wrote down on the board: 'the bench will make the difference.' And the bench made the difference," said a delighted Wilmots. The Africans, ranked 22nd in the world, scored from the penalty spot midway through the first half in Belo Horizonte and looked set to hold on against a Belgian side that looked short of ideas despite its array of youthful attacking talent. But two substitutions from Wilmots in the second period -- bringing on Fellaini for Moussa Dembele minutes after Divock Origi replaced the unimpressive Romelu Lukaku -- changed the game. Algeria coach Vahid Halilhodzic admitted Fellaini's influence had been key. "Fellaini is one of the best headers of a ball in Europe, he brings a lot to the game in terms of his physical impact," said Halilhodzic. "He was so dominant in the air that my players didn't have an answer to it. He's an extraordinary player who changed the game." In contrast with most of the matches at the World Cup so far, the contest was drab in its early stages, with both sides struggling to create clear-cut chances. Belgian midfielder Axel Witsel hit a powerful shot from long range in the 21st minute but goalkeeper Rais M'bolhi was able to parry. But just minutes later the Africans broke the deadlock after Jan Vertonghen pulled down Sofiane Feghouli in the penalty area as he tried to get on the end of a teasing cross from Faouzi Ghoulam. Vertonghen was booked and Feghouli got up to strike the ball to the left of Thibaut Courtois, who dived the wrong way, scoring Algeria's first World Cup goal since Djamel Zidane netted against Northern Ireland in 1986. They were previously scoreless for 506 minutes, just 12 minutes shy of surpassing Bolivia's record for 517 scoreless World Cup minutes. The goal jolted the 11th-ranked Belgians into life but although they continued to dominate possession, they struggled to create clear-cut openings, forced to rely on the occasional shot from long range. Powerful forward Lukaku was a peripheral figure and Hazard was unable to work his magic to create a clear-cut opening. The early minutes of the second half followed a similar pattern, with Belgium probing but failing to create any coherent attacking moves. Witsel had a chance to level but failed to keep his header down from a corner. Algeria, the top ranked African side at the World Cup, at number 22, nearly doubled their lead when a glancing header flew just wide of the far post after a corner. Wilmots threw on Origi and then Fellaini and M'bolhi was forced to save with his feet after a fine Origi effort. Just four minutes later Fellaini was first to get his head to a ball from Kevin De Bruyne, pulling Belgium level and Mertens put his side in front with 10 minutes left on the clock. Fellaini almost scored again but M'bolhi showed tremendous reactions tip his goal-bound header over the bar. 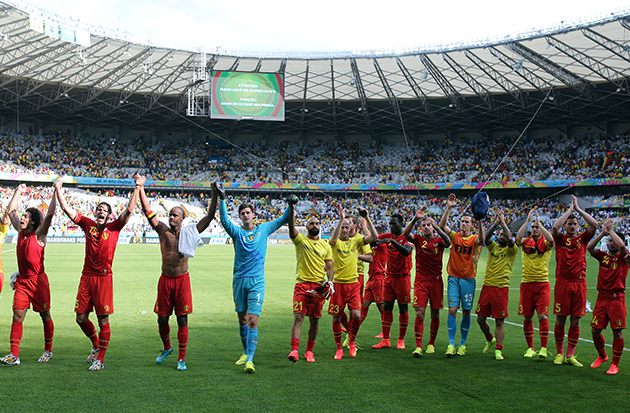 The match was Belgium's first at a major international championships since the 2002 World Cup in Japan and South Korea. Their best ever World Cup showing was a semi-final in Mexico in 1986.